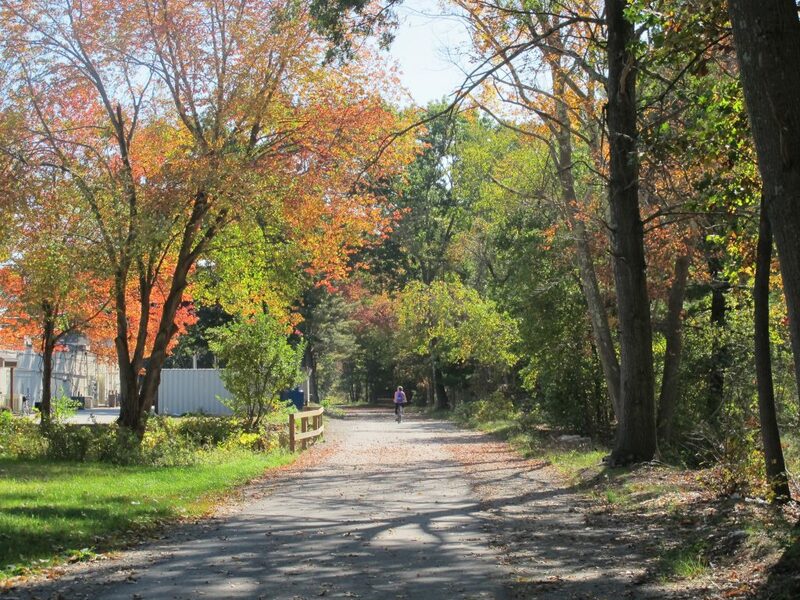 The Bruce Freeman Trail is a rail trail through the communities of Lowell, Chelmsford, Westford, Carlisle, Acton, Concord, Sudbury, and Framingham in Massachusetts — following the 25-mile route of the old New Haven Railroad Framingham & Lowell line. A beautiful October day on the trail in Acton. Phase 2B (Concord – Rte 2 Bridge) – GPI is moving forward with the 75% design submission of Phase 2B (the Rte. 2 bridge). The 100% design submittal is tentatively scheduled for January/February 2019. The current advertisement date goal for construction of 2B is June 2019 or earlier. Phase 2C ( 3.0 miles in Concord) This section of the trail is scheduled to open in spring 2019. Phase 2D (Sudbury from the Sudbury/Concord line to Rte. 20 – 4.5 miles) – Sudbury has been proceeding with the 25% design of the 4.5 miles of the BFRT in Phase 2D. Phase 3 (Sudbury & Framingham – 4.8 miles) – Right of way still owned by the railroad company CSX. The Bruce Freeman Trail is open to non-motorized uses such as cycling, jogging, walking, and skiing. Other uses such as rollerblading and equestrian use may also be possible depending on the design.